Joining a crane association can help you in a number of ways in connecting to the industry - being more aware of standards and crane operator certification issues and networking with other crane owners and crane operators. Some of the more popular crane associations are discussed below. Find out if membership is for you and join today. Most associations are non-profits and are designed to get you the best information in their focus areas such as crane manufacturing, crane safety, and union affiliations. Started in 1973, the Crane Owner's Association collaborate with local unions to promote collective bargaining, training, and certification initiatives. 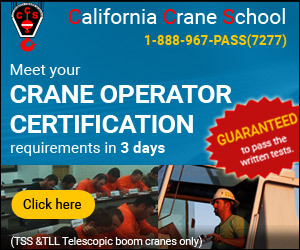 Dedicated to increasing education opportunities for its members and improving crane and rigging operations. Focused on providing member companies and members with safety, regulatory, and best business practice information and services.